Former minister Gideon Sa'ar says PM Netanyahu should not resign, has wide base of support. 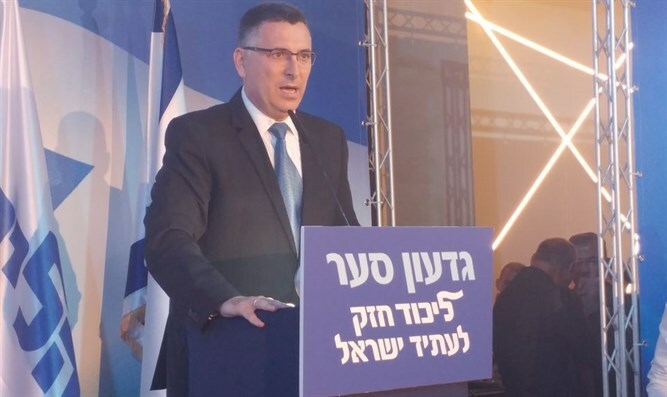 Former Interior Minister Gideon Sa'ar spoke at Limmud FSU's Eilat event about Israeli Prime Minister Binyamin Netanyahu's recent speech, in which he criticized police conduct. "I can understand the Prime Minister's feelings," Sa'ar said. "I will not criticize his speech as if I were a speech critic, but I do not have to agree to every word he said. Netanyahu does not need to resign, even if the police recommend bringing him to court. He has widespread support from the public." Regarding former Prime Minister Ehud Olmert's resignation in September 2008, Sa'ar said, "I demanded Olmert resign even before the police opened an investigation against him, and after they opened it. He had very little public support. I will not demand Netanyahu resign." "You cannot decide someone's fate based on protests and the headlines in studios. The legal authorities are very strong in this country, and their processes need to be carried out in as pressure-free an environment as possible." When asked his opinion on the demonstrations in Tel Aviv and whether he would join right-wing protests against corruption, Sa'ar said that those demonstrating "have political motivations, and are aiming for their desired political result. They are not dealing with the issue itself." "it's amazing to see how all those people who speak with longing about former Prime Minister Menachem Begin's term and how the Likud used to be, admit that they did not vote for Begin, or even for the Likud." Netanyahu is currently being investigated on suspicion of receiving cigars and champagne from wealthy supporters, including Israeli businessman and Hollywood producer Arnon Milchan and Australian tycoon James Packer, was nearing completion. A second investigation centers on suspicion that that Netanyahu sought more favorable coverage with the publisher of the popular Yediot Aharonot newspaper.